Johannne Berend Petermann (AKA Johann, John and Bernard) was born in Ganderkesse, Duchy of Oldenberg, Germany in 1843, the son of Johann Christopher Petermann and Gesche Margarete Engelbart(h). Berend Petermann married Sophie Steuer in Elfleth, Germany in 1879. At the time of his marriage he was listed as a helmsman. The Petermanns immigrated to the US sometime between their marriage in 1879 and the birth of their son, Christian August, who was born in Brooklyn, New York in 1883. Perhaps because of its proximity to Bremen, one of the major port cities in Europe, many young men from Ganderkesee went to sea. Johann Berend Petermann first went to sea at the age of 16. By the time he was 30 he had signed on for 12 tours of duty which took him "around the world" several times. He spent 14 years at sea; his last voyage was in 1873. From my armchair point of view it seems like a great adventure. 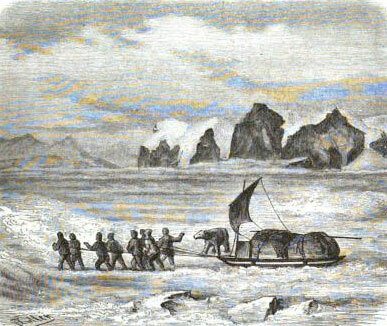 Berend's first voyage was to Greenland on a whaler in the winter of 1859. Later that same year he sailed for the Far East — destination Hong Kong. In April 1861 the ship he was on was turned back from Charleston, North Carolina a few days after the Confederates fired on Fort Sumter starting the American Civil War. 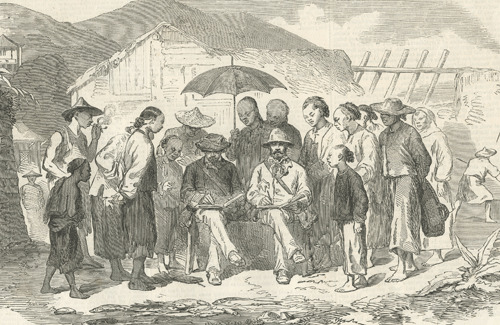 He headed for South America in the fall of 1861 and continued on to China. I believe that he spent two plus years in the Orient before leaving his ship in New York in 1864. He started as a common seaman but by 1872 he was a helmsman. The helmsman is the person who steers the ship. On the old sailing ships any "able bodied seaman" could steer the ship. However, I believe that the designation that Berend received as "helmsman" was more specific. The crew lists indicate that the helmsman was separate occupation and they received a higher pay than seamen. Berend Petermann was not listed on the Bremen Crew Lists after 1873. However, I believe that he was still employed on the water. He was listed in the port of Elfleth, German as a "pilot". A pilot guides boats in harbors or waterways where a specific knowledge of the underwater topography is needed. Elsfleth is on the Weser River, a shallow waterway that connects the major German port cities of Bremen and Bremerhaven. The Weser is/was plagued by shifting sand bars and silting. The following list of voyages was taken from the Bremen Sailors Registry and the Bremen Crew Lists. Berend Petermann was listed 12 times. I do not know how the Sailors Registry was organized and annotated. It is not in alphabetical order. Bemerkungen [remarks], sometimes this entry is a number*, often it is gut [good] or sehr gut [very good], sometimes no remarks were made. The writing for all of the entries for Berend is the same. I assume that the muster out date would not be know until the end of the trip. The "remarks" could not have been added until the end of the trip. *A No. always seems to have been given after the first voyage. If a seaman continued on a number of voyages he sometimes received future NO.s as he went along, but I do not know what the numbers signified. Classification, such as officer, sailor cook, etc. The Captain, the name of the ship, type of ship and destination were listed alongside of the crew list. I do not know if the ship always reached its stated designation. Sometimes collaborating records help to determine if the ship made it to the destination. The Sailor's Registry for Berend Petermann does not list the length of time he spend at sea on this voyage. However, the registry for fellow crew member, Johann Bruns of Leuchtenberg age 18, indicates that the HUDSON was out for 6 months and 5 days. In January 1859 the HUDSON had a crew of 59 including the captain. The crew included two other men from Ganderkesee: J. H. Engelberg age 45 and Heinr Meyer age 18. Beluga, Narwhal and Bowhead whales are found in the Greenland in the winter and the whaling industry was active there in 1859. Berend's brother, Johann Heinrich Peterman, had been on the same trip the year before. 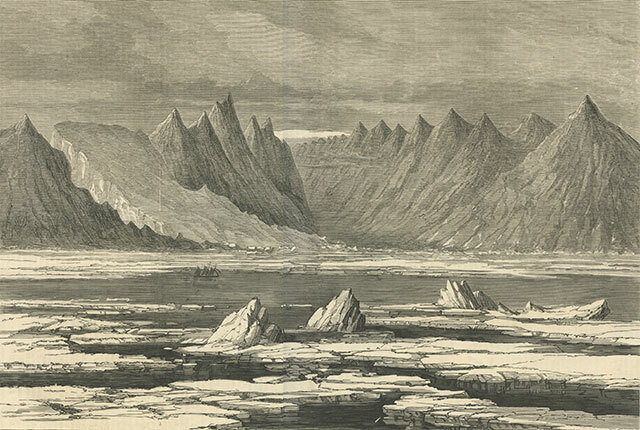 Johann Heinrich Petermann was away 5 months and 10 days when he traveled to Greenland in January 1858. Interestingly, 1859 marked the beginning of the end of whale fishing. Oil was discovered in Titusville, Pennsylvania; As a result the use of whale oil as lubricant decreased and kerosene replace whale oil for lighting. On September 18, 1850 the ship HUDSON, 394 tons, arrived in the port of New York under the command of Herm Hohorst from Bremen with the following count of passengers: "23 cabin, 11 steerage 148 under deck including six babies"
The ship HUDSON under the command of Capt. Hohorst arrived in New York July 7, 1852, with 192 passengers on board. 49 year old Lud Florks died at sea living his wife and 4 children to go on. 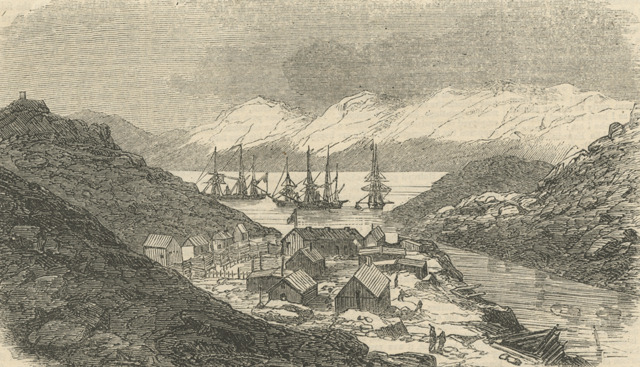 Melville Bay is a large bay of the northwestern coat of Greenland. In 1868, an undistinguished season of seal and whale hunting, the HUDSON was lucky enough to catch at least one 50 feet "fish". 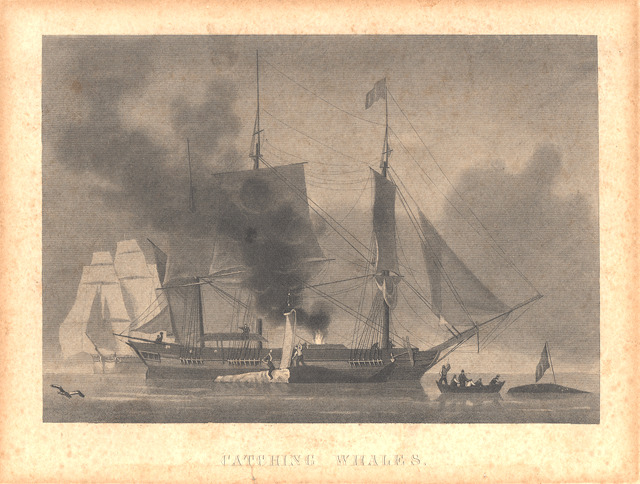 This catch resulted in 150 tons of whale oil and 1,300 pounds of baleen. 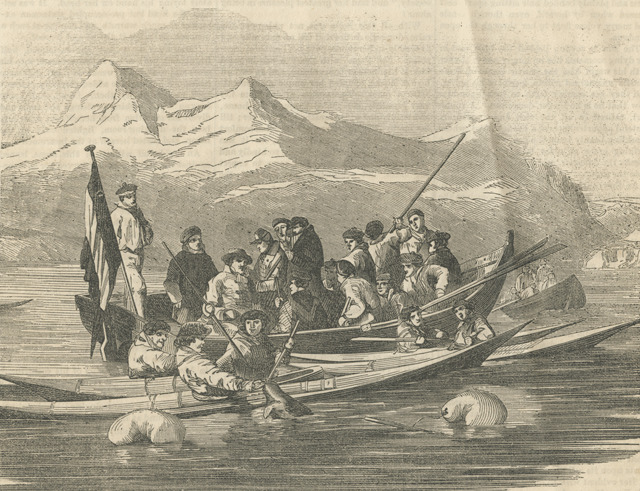 "Bremer Schiff Hudson und Engl Bark True Love in der Davidstrasse Melver Bai der 26 Julius 1862"
ON THE COAST OF GREENLAND, ILLUSTRATED LONDON NEWS FEB 2, 1856. 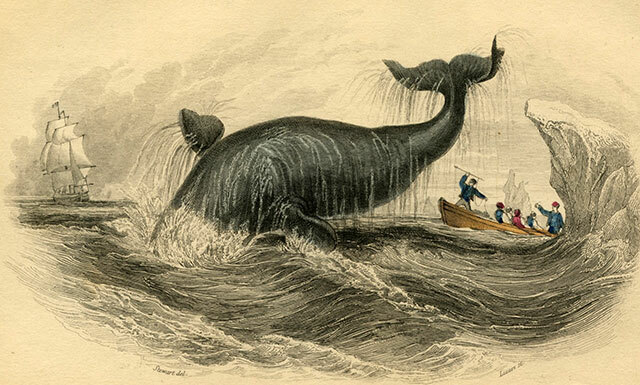 You Tube song and several fabulous contemporary images of whaling in Greenland in the mid 1800s. 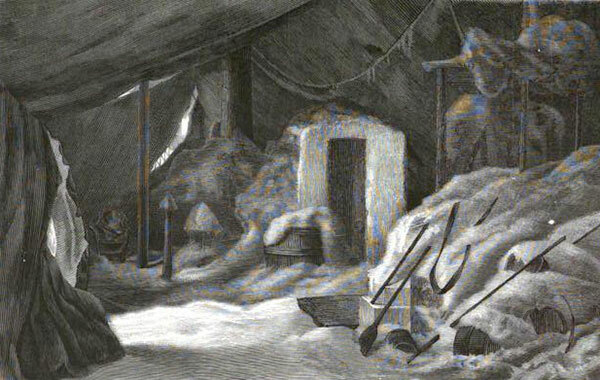 Do a Google book search for Die zweite Deutsche Nordpolarfahrt in den Jahren 1869 und 1870 unter Fuhrung by Karl Koldewey for more amazing images of the Arctic in the winter. 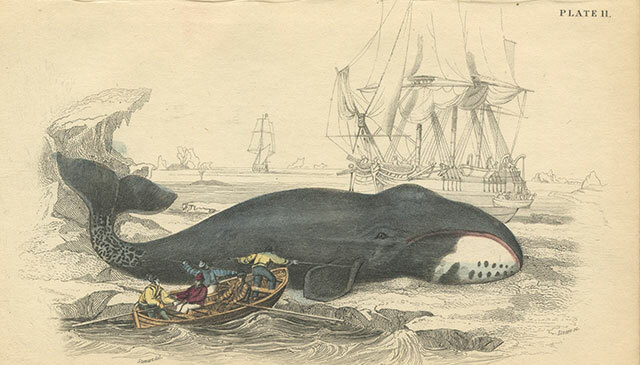 The bowhead whale was a mainstay of the whaling industry. The bowhead was found only in the Arctic. It was hunted for its oil and baleen (whalebone). This material is now scraped very fine, and mixed with the silk fibre of dress silks, to make the cloth rustle when worn, and also give it stiffness. It is now of such high value commercially that the baleen whales are being pursued as far north as vessels can go." Whale oil is no longer the valuable commodity it was forty years ago, but the hunt for baleen will ultimately exterminate all the whales of this Family. The Bow-Head Whale is of medium size, rarely attaining 65 feet, and usually runs under 50; yet it is uncommonly rich, both in baleen and oil. A large whale of this species is said to yield 275 barrels of oil, and 3,500 pounds of whalebone. Bowhead whales can grow up to 66 feet in length and are the longest living mammal. It is though that these whales can live up to 200 years. In 2007 a bowhead whale caught in Alaska had a harpoon from the 1890s embedded in it's neck blubber. 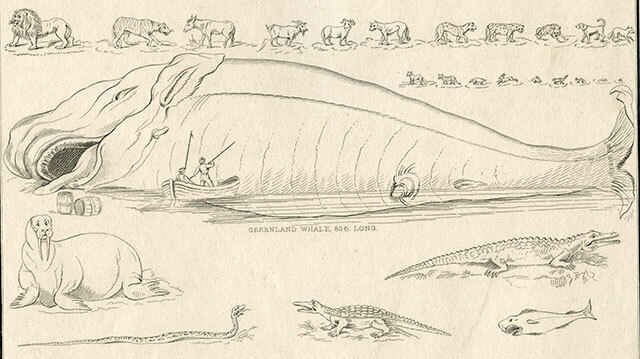 It is possible that there are whales still living off Greenland that were there when Berend Petermann went whale hunting in 1859!! This would have been the first time that Berend "crossed the line" that is, the Equator. On many vessels there was an initiation ceremony the first time a sailor crossed the line. The area around the Equator suffers from long calms and alternatively, in certain seasons, to violent hurricanes. To see an image of the JOHANN LANGE go to Ask Art . The Palmer List does not include information on the JOHANN LANGE. Johann Lange (1775-1844) was a famous ship builder in Bremen. December 14, 1853, Ship Johann Lange Captain Johann Lemke, Bremerhave through Liverpool 1050 tons, passengers 553, most of the passengers were Irish, 3 German cabin passengers, 3 female deaths, 1 male death (Ship Manifest). June 19, 1854 the New York Times listed: "Arrived Ship Johann Lange, (Brem.) Lamke, Bremen 38ds [38 days] with mdse and passengers to L. Von Hoffman". A fifth lot of orchids, from Simunjon, sent by the 'Weraff', left Sarawak 19 May1855, arrived Singapore 24 May, left Singapore by the 'Johann Lange' [? ]; these 'arrived all dead'. In 1854 and 1864 the trip from Bremen to New York took 37/38 days. Since the JOHANN LANGE had made several runs from Bremerhaven to New York under Capt. 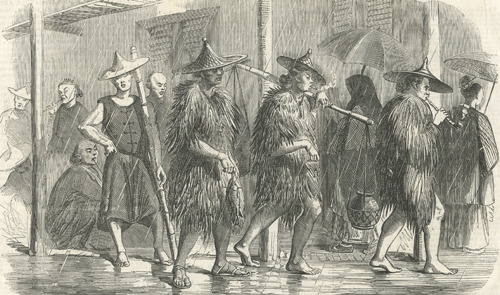 Lemke in the years preceding Berend's enlistment I though that they might have headed to Hong Kong via New York. However, I could not find an arrival of the JOHANN LANGE in New York in the late fall of 1859. 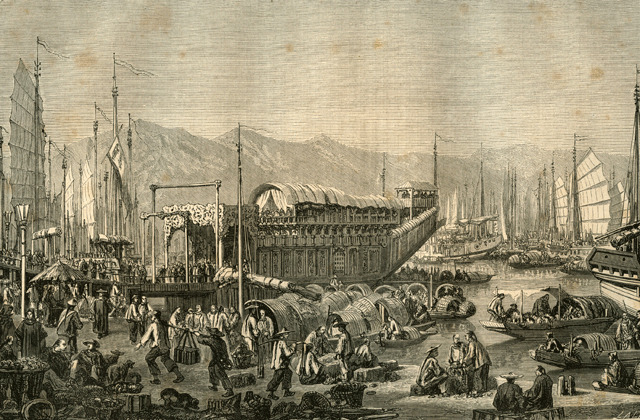 In 1859 the Suez and Panama canals did not yet exist. Before these canals opened the trip from Germany to the Orient required either going around the Cape of Good Hope on the southern tip of Africa or Cape Horn at the southern tip of South America. Both routes were used from Europe to the East (and back). The decision to go around Cape Horn versus Cape Hope was dependent to some extent on the time of the year and the prevailing winds. In 1866 the route from Liverpool to the east was around "the Cape" to Mauritius, Penang, Singapore, Hong Kong and Shanghai (Encyclopedia Britannica Vol 25). Cargo going east was generally manufactured good. Cargo retuning were teas and spices. 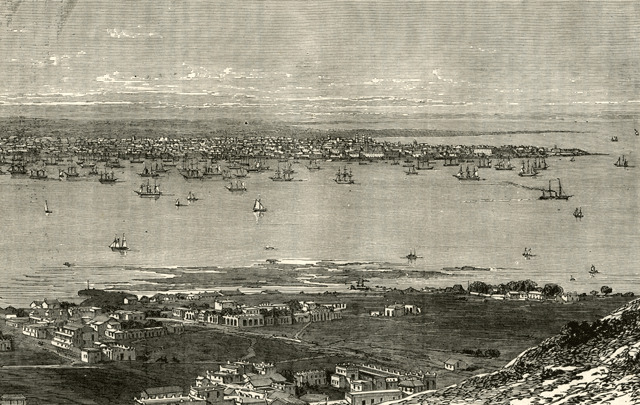 The Suez Canal opened in 1869. Passage through the canal shortened the eastern bound trip from Europe to Asia. In 1889 when the ship BREMEN traveled through the Suez Canal to Hong Kong the following Ports of Call and dates were noted: Port Said 04-20, Aden 04-27, Singapore 05-11, Hong Kong 05-16, Shanghai 05-21, Hong Kong 06-04 - taking a little less than a month from Port Said to Hong Kong. The Panama Canal opened in 1915. Before this canal opened ships went around Cape Horn. Another alternative after 1855 was to sail to Aspinwall (AKA Colon) on the Atlantic side of the Isthmus of Panama. From there goods and people were moved by train to the Pacific side where other ships were waiting to continue the journey. Berend Petermann returned to Germany sometime around January 25, 1861, 15 months after he had departed. He was "home" for a little over two months. He left Germany on the next trip on April 9, 1861. * The records as researched so far indicate a fairly close relationship between the family of Berend Petermann and Friedrich Petermann. Notes: The Clipper ship, ORIENT, sailed from Hong Kong to London in 97 days in 1850. Clipper ships were the fastest ships on the seas. Technically I suppose the Johann Lange could have made it from Bremen to Hong Kong and back in 15 months. Ships that moved this fast were usually carrying light perishable goods, such as tea. The crew numbered 15 - no one else from Ganderkesee. Because of the way it was rigged a bark could sail with a smaller crew than a ship. The American Civil War erupted between the North and the South on April 12, 1861 when Confederate artillery fired on Fort Sumter in Charleston Harbor. The fort surrendered to the South 34 hours later. President Lincoln ordered a blockade on Charleston harbor on April 19, 1861. The Bark COPERNICUS left Germany on April 9 1861 bound for Charleston, S. C.. She ran afoul of the U. S. naval blockade of Charleston on June 2, 1861 - almost 2 months later. What was she doing all that time? Did the crossing take that long? Did she make it into Charleston harbor and get warned off on her way out? Or was she somewhere else and did not try to get into Charleston harbor until the beginning of June? Nothing thus far has gone in or out without my permission, except small vessels, which our depth of water will not allow us to overtake"
* "in ballast" — a ship carrying ballast water and no cargo. It is very interesting that she had no cargo. I could mean she unloaded cargo in Charleston and because of the war there was no cargo to pick up. It is unlikely she came all the way from Germany in ballast and then hung around for a few weeks. Abstract of log of U. S. big Petty. Lieutenant E. G. Parrott, U. S. Navy, commanding. June 3, 1861. — (Latitude, 32°47; longitude, 78°52') Boarded Bremen bark Copernicus, bound for Baltimore. She certified that she had been boarded by the Minnesota and warned not to enter any port south of the Chesapeake." Charleston, South Carolina is at latitude, 32°54 longitude, 79°58'. Berend Petermann returned to Germany around August 23, 1861. Berend left Germany on his next trip on October 25, 1861. See Copernicus (1851) on the Palmer List of Merchant Vessels.
" The Bremen bark COPERNICUS was built at Vegesack/Grohn by Johann Lange, for the Bremen firm of N. Gloystein Söhne, and was launched on 16 April 1851. 223 Commerzlasten / 481 tons; 37,8 x 8,8 x 4,9 meters (length x beam x depth of hold). 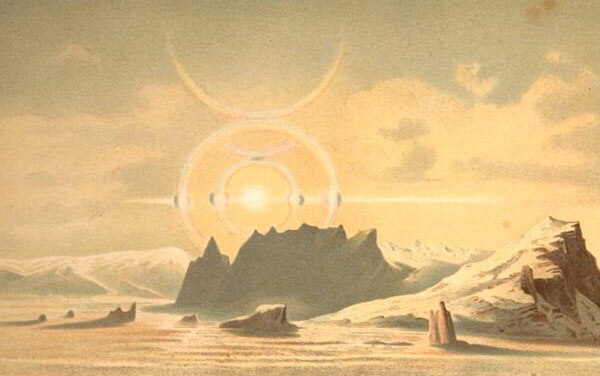 Her masters were, in turn, Heinrich Wieting, Bremerhaven (1851-1857), C. J. H. Rahe, Bremen, Hermann Mahnken, Vegesack (1860), and J. Haesloop, Vegesack (1864)." The Palmer list includes an image of the ship. Approximate location of the Bark Copernicus when it was turned back by the Union Blockage. 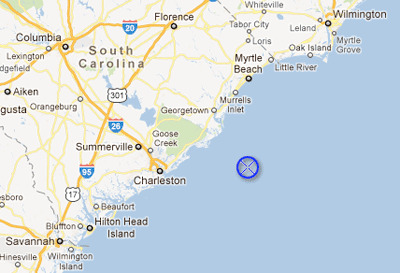 About 60 miles off from Charleston Harbor. "Vandalia" The Prize "Arthur Middleton" "Roanoke"
The Bark APOLLO is not listed as a German ship by the Palmer List. The 1861 Crew List designates it as a "bark". Norway Heritage - Bark shows a typical Bark. Berend was listed as "matrose" [seaman, sailor], living Mettlesburen, born Ganderkesee. Crew of 14 - no one else from Ganderkesee. 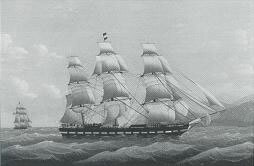 The APOLLO was captained by A. Hagedorn when it left Bremen in 1861; destination Argentina via Montevideo and Uruguay. The APOLLO traveled father than its stated destination of Argentina. The arrival of the bark APOLLO posted in New York City in April 1864 indicated that the ship came from China with Hagedorn as its captain. This would suggest that they continued their 1861 journey from Argentina and Uruguay by rounding Cape Horn and sailing on to China. 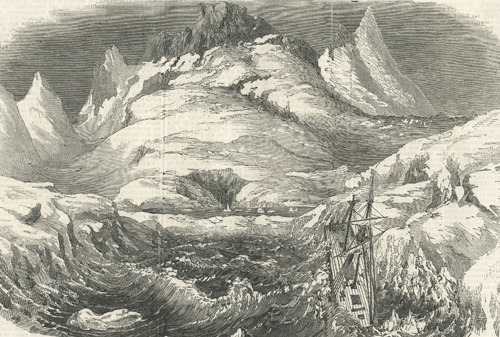 The passage around Cape Horn presented many discomforts and hazards including cold weather, high precipitation, strong winds, strong currents, large waves, and icebergs. They most likely went around Cape Horn both going to and returning from China. A Port of Call may have included Sidney, Australia. New York Times April 13, 1864 — Marine Intelligence — Arrived — Bark Apollo, (Brem.) Hagedorn, Shangai 118 ds* via St Helena**, February 10 with teas etc to Thayl and Peabody. Has had heavy winds from Bermuda. ** St Helena, where Napoleon was exiled after Waterloo, is a small and windswept island in the Southern Atlantic almost 2000 kilometres west of Africa. It measures only 47 square miles. It was an important stopover for ships sailing from Asia to Europe. Two years and six months was not an unreasonable time to go from Germany to Asia and back. According to several web sites circumnavigation of the world could take 3 or 4 years. "Petermann, Berend of Ganderkesee born 1843 Matrose [sailor] on the ship Apollo gr--- A. Hagedorn, deserted ship on 17 April 1864 in New York"
Note: I cannot read several words and phrases. The writing is small and crowded and the photo copy is fuzzy. Whatever the case, Berend Petermann returned to the sea in 1867. How did Berend Petermann get from New York in April 1864 to Bremen by the spring of 1867? What did he do during that period of time? He was not listed on any additional voyages on the "Sailors Registry" between 1864 and 1867 (when he sailed on the brig Dorothea). Was he living in America for all or part of that time? Port of New York January 29, 1866, CLEARED, Bark Apollo (Brem. ), Warnken, Bremen - Scholberg & Koper. Le Porte de Montevideo a recu, en 1873, 1,818 Navires (907,328 tonneaux) anglais, francais, italines, espagnols, bresiliens, allemands, des Etats-Unis, suedois, hollandais, argentins, etc. " Note: Fangmeyer had also been captain of the DOROTHEA in 1864, see New York Times January 1864, below. This is the first voyage that Bernard made after his "desertion" in 1864. I did not find an image of the DORETHEA. The Crew list designates it as a "brig". Berend was listed as a "montrose". There were 9 crew members, no one else from Ganderkesee. Seeing that the DOROTHEA had docked in NYC in 1864 on her way from Bahia. I checked, but did not find the DOROTHEA listed as arriving in New York Harbor between 17 August 1867 and 26 January 1868 - it would appear that she was not making runs between Bremerhaven and Bahia via New York during that period. In fact, the route from Europe to Bahia appears to have been past the Cape Verde Islands off the coast of Western Africa. 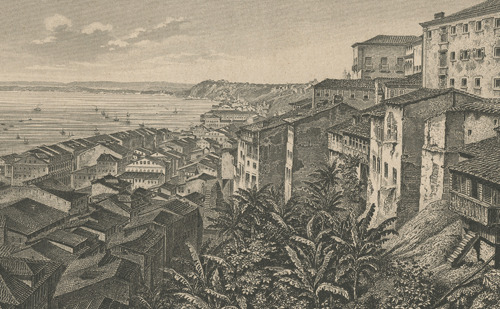 Exports from Bahia in the mid 1800s were : sugar, cacao and tobacco. 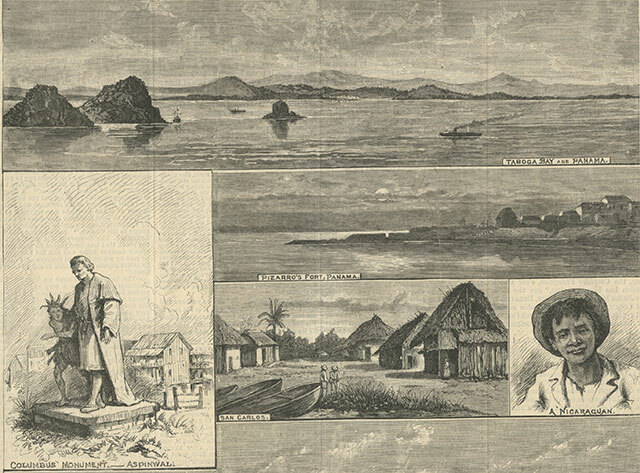 A German colony was founded at Sao Jorge dos Ilheus (Ilheus), Bahia, Brazil in 1818. Ilheus was a port city and the center of Brazilian cocoa export. There were large cocoa plantations cultivated by the German colonist in the area. 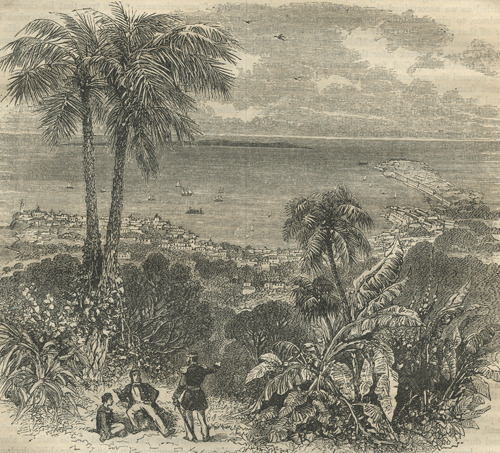 I do not know if there was any connection between the trip to Bahia in 1864 and these cocoa plantations, however, it seems quite possible. Berend Petermann returned to Germany about January 26, 1868. He left on his next trip on April 8 1868. I did not find an image of the CLARA. A bark (bargue) was a 3 masted vessel with fore and main masts square rigged. www.immigrantships indicates that over the years the CLARA was an immigrant ship. They did not have any listings for 1868 (as of November 2010). Crew of 13 - no one else from Ganderkesee - "montose" - Captian Probst. Bark Clara arrived in the Port of Baltimore on August 3, 1867 and 23 December 1872 by Immigrant Ships Transcribers Guild. On August 2, 1867 the New York Times reported that the "Clara - Bremen bark, from Bremen for Baltimore 25th ist., 40 miles east of George's - (by pilot-boat W. H. Aspinwal, No 21)"
New York Times Marine Intelligence, January 19, 1870 — "Bark Clara (N.G.) Probst, Rotterdam 48 ds with mdse to Fruch Edye & Co. — vessel to F. Schwoon. 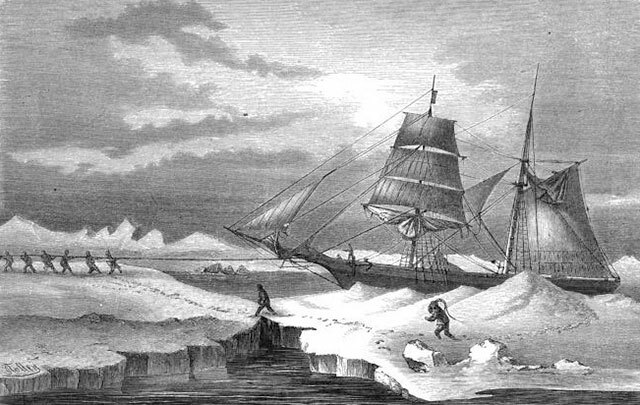 Came the sourthern passage and had fine weather, ; Dec 15 lat. 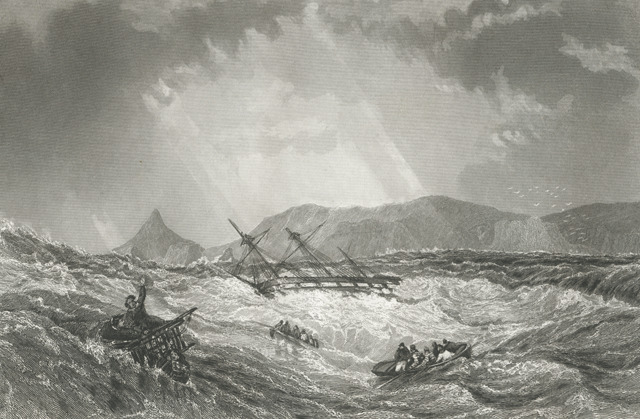 77 l-- 30, encountered a gale from S. W. during which lost foretopmast and both top gallant masts." Berend Peterman returned to Germany around August 9 1868. He left on his next trip on August 28, 1868, signing up again for service on the Bark CLARA. Crew of 13 - about half the crew were the same as the previous service on the CLARA. Berend Petermann returned to Germany at the beginning of June 1869. Clara, Bremen, John Dan Probst, Bremerhaven, no. of aliens 123, no. of citizens, four, October 8, 1868 consignees Von Ka(tear) and Arens, owners, Shwoon & Co.
One voyage in 8 months - why? Note: In 1867 the CLARA made three stops in Baltimore: April, August and December. Berend Petermann left on his next trip on June 16, 1869. I did not an image of the CHARLOTTE. The Crew List designates it as a "schiff". She was consistently listed in the shipping news a "ship". Since there was a designation "steamship" in these reports we can assume that she was under sail and not steam powered. The CHARLOTTE as an immigrant ship that made fairly regular runs between Bremerhaven and New York. The Captain was between 1863 and Johann Heinhich Gatjen. Designations of (N.G.) and (N.G.L.) upon her arrivals in New York Harbor in 1868, 1869 and 1871 indicate that she was part of the North German Lloyd fleet. However, I cannot find her on any North German Lloyd lists on line. Berend signed on to the Charlotte on 16 June 1869. 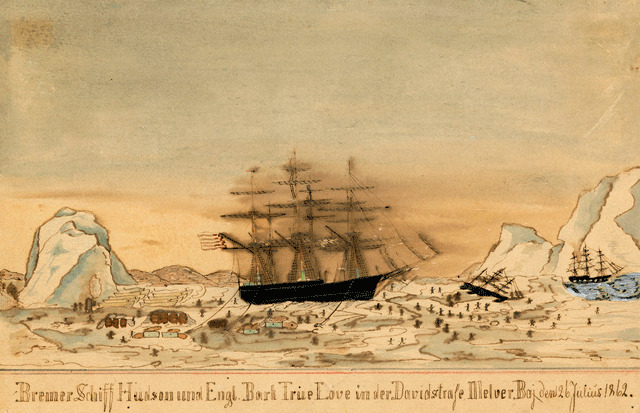 The ship left Bremen on/or/about June 17 and arrived in New York Harbor August 5 after a 49 day crossing. New York Time Marine Intelligence Saturday July 4, 1868 — Arrived, Ship Charlotte (N.G.) Gatjen, Bremen 57 ds. with mdse and 504 passengers to Hennings & Gosling. Had one death and two births on passage; first part of passage experienced stormy weather; light westerly winds for past fortnight; was in company for 10ds with British ship Pomona of St John N.B. from Liverpool to Quebec; parted company May 26 lat. 56 36 lon. 17 26 W.; June 11 lat 49 3 on. 36 signaled No. bark Cydae, from Belfast for Miram-chi; saw a number of icebergs from lat 44 to 47 lon. 45. ➳ This was a ship that Berend was on. New York Times Marine Intelligence August 3 1869 — "Below" Ship Charlotte (N.G.) "Gatzen" from Bremen June 21, 1869. I am fairly sure that "below" meant that the ship was waiting for some reason in the area between Sandy Hook and Staten Island, in what is known as the Lower Bay. Maybe she was waiting for a berth to clear or was at quarantine. The manifest for the Charlotte indicates that she arrived August 05, 1869. Ancestry.com show 3 pages for the manifest with a total of 100 passengers. August 6, 1869, New York Herald, Ship Charlotte (NGL) Gatjen, Bremen, 49 days with mdse and 100 passengers to master. Had fine weather during passage. Where were Berend Petermann and the Bremen Ship Charlotte? She is not reported in the New York Times or the New York Herald as arriving in New York (or indeed anywhere) during that time. The next record I can find for her was in June 1871. New York Time Marine Intelligence June 19, 1871 — Ship Charlotte (N.G.) Gatzen, Bremen 40 ds, with "mdze" and 100 passengers to Funch, Edye & co. Came the northern passage, and had variable winds and was 18 ds W. of the Banks. New York Time Marine Intelligence December 19, 1871 — Cleared Ship Charlotte (Ger.) Gatjen, Bremen via Philadelphia, Funch, Edye & Co. 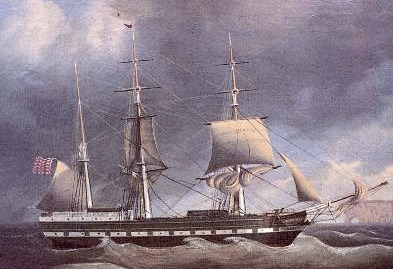 The Charlotte was still in service in 1881 when she was cleared on April 11. However she had a new captain. Ship Charlotte (Ger.) Guthsmuths, Bremen, Hermann Koop & Co.
Berend was supposedly on the Ship Charlotte from Aug 5, 1869 to April 28, 1870. As indicated by the above records I can only find one crossing for the Charlotte during that time period. The Charlotte left Bremen on or about June 15, 1869 and arrived in New York August August 5, 1869, listed as a North German Lloyd ship under the command of Captain J H Gatjen from Bremen, 1206 tons, 100 passengers. She arrived in Baltimore, Maryland from New York on August 27th. She left Baltimore September 12; destination not stated. Berend Petermann returned to Germany around April 28, 1870. 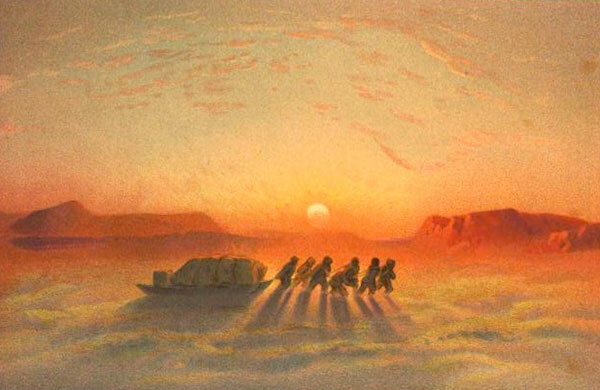 He left on his next trip on May 9, 1870. Berend Petermann born 1843, born Ganderkesee, residence Hoyerswege, matrose (sailor, seaman) muster date, May 9, 1870, ship TEXAS, port of departure, Bremen, destination, "See" [sea], captain E. Mentzen duration of service 4 months The manifest indicates a crew of 15 including two of Berend's potential relatives, Fredrick Petermann born Ganderkesee, 1820, residence Ganderkesee, cook, and Heinrich Petermann, born Ganderkesee, 1852, residence Ganderkesee, steward (?). In addition there were two other crew born in Ganderkesee: Johann Tonnies (?) born 1840, matrose and Johann Behr-ns born 1842 matrose. The Captain was E Mentzer. I did not find an image of the TEXAS. The Crew List designates it as a "Bark". The Bark TEXAS out of Bremen was in Galveston, Texas quite frequently in 1867, 1868, 1869, 1871, & 1872 but not listed in 1870. The bark TEXAS was an immigrant ship. Many German immigrants entered the United Sates through Galveston from the 1850s to the 1900s. The immigration rate was particularly high in the years after the Civil War. Fredrich Petermann also sailed on the Texas in June 29, 1869 and August 25 1871. Heinr Petermann also sailed on Texas in April 30 1871 and Aug 25 1871. Berend Petermann returned to Germany around September 9, 1870. He did not leave Germany on another trip for almost a year. The Franco-Prussian war began in July 1870 when France declared war on Prussia. The French were defeated and Wilhelm I was crowned Kaiser of a unified German in January 1871. When the Franco Prussian was broke out in July 1870 the North German Lloyd suspended service between Bremen and New York. The North German Lloyd was the carrier for the US mail. Service was resumed in October 1870. Berend Petermann left on his next trip on August 4, 1871. The GRAF BISMARCK [Count Bismarck] was named for Count Otto von Bismarck. She is listed on the Palmer list. The GRAF BISMARCK was built in 1870 in Greenock, Scotland by Caird & co. and operated by the Norddeutscher Lloyd Steamship company out of Bremen. The ship was 316.5 ft X 39.1 ft. Single-screw, 14 knots, 2,406 registered tonnage, 900 horsepower. The North German Lloyd run from Bremen to the West Indies was started in 1871. The route began at Bremen with calls at Southampton, Colon (Panama), Savanilla (Columbia), Puerto Cabello (Venezuela), La Guayra [Guaira] (Venezuela) and then back to Savanilla and Colon. From Colon the ports of call were St. Thomas (Virgin Islands), Cherbour, Southampton and finally Bermen. The three North German Lloyd ships that made this run were: the screw steamship Konig Wilhelm I, the Kohn, and the Graf Bismarck. They all carried both passengers and cargo. This route was unprofitable and was discontinued in 1874. Colon was also known as Aspinwall, Panama. The new Steamship Graf Bismarck, of the Bremen line, was successfully launched at Greenock, Scotland, yesterday afternoon"
"The steamship Graf Bismarck arrived at Aspinwall on the 18th instant at 3 p. m. The most important and encouraging feature connected with the arrival of this steamer, says the Panama Star, is the unusually large cargo she takes to Europe, and which, considering that its the commencing of a new line of steamers, is very satisfactory. Her cargo amounts to 10,627 packages for Europe. Some cargo had to be left behind, which was waiting her arrival in Colon. If matters go on at this rate it is probable the Company will have to decide on putting on two steamers a months." Brooklyn Eagel, August 16, 1871: London August 16. The North-German Lloyd steamer Bremen, Capt. 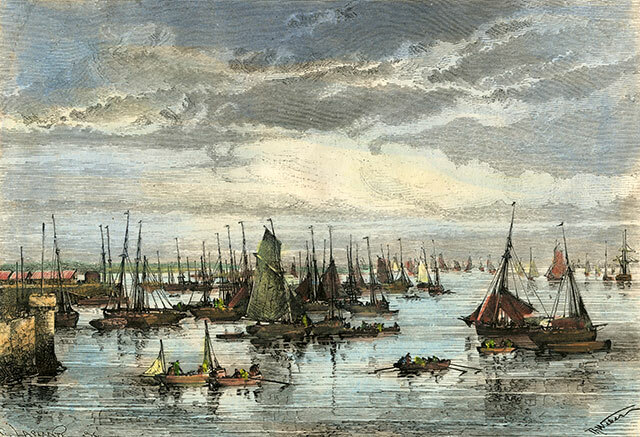 Lodewigs, from New York August 3 arrived at Southampton to-day en route to Bremen. The Bremen towed into port the North-German Lloyd steamship Graf Bismarck, which had broken her shaft on the voyage from Bremen to Aspinwall. "Arrived Out — London, Aug 16. — The North German Lloyd steamship Bremen, Capt. Lodewigs (sic) from New York Aug. 3 arr. at Southampton today en route to Bremen. The B. towed into port the North German Lloyd steam-ship Graf Bismarck, which had broken her shaft on the voyage from Bremen to Aspinwall." The North-German Lloyd steamer Bremen, from New York, passes Hurst Castle on 8:40 a. m. on the 16th. She had the steamer Graf Bismarck in tow, with her main shaft broken"
It seems the BREMEN (1858) also suffered a broken shaft. "14 January 1860, reached Southampton under sail with a broken shaft; out of service undergoing repairs at Southampton for 6 months"
Broken propeller shafts seem to have been a relatively common occurrence with the early steamships. It was believe to be caused by faulty iron welding of the shaft. If the ship had only one propeller she basically could not move with a broken shaft. How long did it take to fix the main shaft of the GRAF BISMARCK? "The Graf Bismarck, Capt W Nordenholdt , sailed from Southampton on Monday with mails for St Thomas, Colon, Savanilla, La Guayra, Puerto Cabello, Curacoa, and ports in the Pacific (Via Panama) £ 1,500 in specie, and a large number of passengers"
The City of Aspinwall (also known as Colon) is located on the Atlantic side of the Isthmus of Panama and was dedicated in 1852 in honor of William Aspinwall (1807-1875). William Aspinwall was a shipping magnate who after the start of the California gold rush in 1849 built a railroad across the Isthmus of Panama to avoid the arduous journey around Cape Horn. 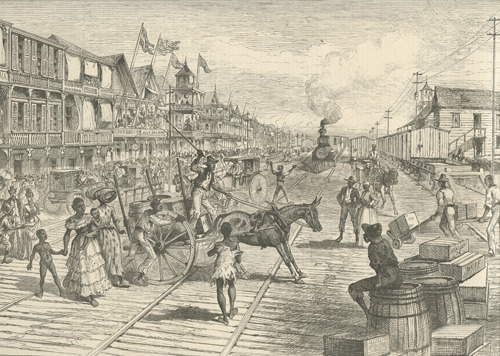 Construction of the railroad was completed in 1855. The Graf Bismarck disemparked passengers in Aspinwall who connected via Panama to all ports in the Pacific. Berend Petermann returned to Germany around February 5, 1872 he appears to have turned around and left immediately; returning to the West Indies on the GRAF BISMARCK. The Graf Bismarck was in New York in 1873. The Steamship Graf Bismarck was cleared to sail on July 3, 1873 from New York. Steam-ship Graf Bismarck (Ger.) Nordenholdt, Bremen via Southampton, Oerichs & Co. (Marine Intelligence New York Times). "undoubtedly made the stormiest passage of this or any other recent season. Fortunately the Bismarck, which of late years has been employed in the South America department of the company's service, is one of the best of the Clydebuilt steamers, only four years off the stocks, and manned and equipped in the most efficient manner..... On Thursday, the 12th utl., she left Bremen, with well-filled coal-bunkers, 5,000 bags of malt, and a large assortment of general merchandise."" She was also carrying twelve cabin and 40 steerage passengers. In addition to passing through two hurricanes the Bismarck had to deal with multiple towering icebergs - a rarity at that time of the year. Next she was subjected to a fifteen hour blizzard with accumulation of up to a foot and a half. 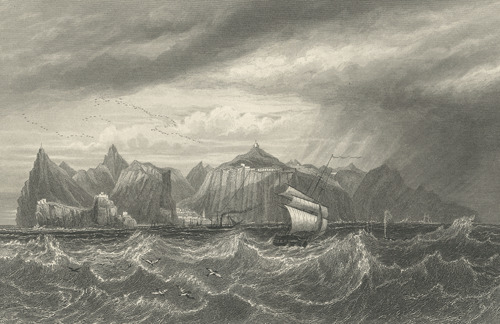 "On her first passage across the Atlantic since 1873" the Graf Bismarck encountered two very fierce storms of hurricane force, a field of icebergs many nearly a hundred feet high, followed by a snow storm of fifteen hours duration when it was "impossible to see the length of the ship and the snow accumulated to on her decks to a depth of a foot and a half ". This article mentions that: the four year old GRAF BISMARCK was in service in South America, had 500 horse power engines (does not say how many) and carried 500 to 600 tons of coal. May 8, 1874 Steam Ship GRAF BISMARCK (Ger.) cleared Meyer Bremen via Southampton, Oelricks & Co.
Berend Petermann returned to Germany around August 25 1872. He left again on October 2, 1872. According to a New York Times article of April 14, 1874, the North German Lloyd was thinking of ending their service to South America which included ports of call at St Thomas, Aspinwall and Savanilla. The Graf Bismarck was to be added to the North American fleet. The GRAF BISMARCK was scrapped in 1898. Another seaman on the Graf Bismarck during this five month tour of duty was Johann Lehman born 1845 in Wismar. Johann Lehman married Julia Erxmeyer and immigrated to Hoboken New Jersey. See Did my ancestors known my husband's ancestors? The Sailors Registry and the Crew Lists indicate that Berend Petermann was at sea from September 30, 1872 to approximately May 12, 1873. This last tour of duty for Berend was as a helmsman on the North German Lloyd steamship AMERICA. The helmsman was the person who steered the ship. The ship's crew list for the AMERICA dated October 2, 1872 indicates a crew of 107 with 4 helmsmen. "Arrived Steam-ship America (N. G.) Bussins, Bremen October 2 via Southampton, 4th, with mdse and 716 passengers to Oelrichs and Co. Had strong westerly winds to the Banks; Oct. 14. no la-, passed a National steam-ship bound E."
Ship Manifest: October 15, 1872, SS America, R Bussins 2,927 tons, mostly German passengers, some Hungarians, one or two Danes and Norwegians, 2 deaths at sea. No tally. The crossing took from German to New York took 12 days. Marine Intelligence European Marine News Southhampton Nov 8 — The North German Llyod's steamship America Capt Bussins form New York Oct 26 for Bremen arrived here today, November 9, 1872 (14 days to return). Note: The AMERICA left Bremen November ? 1872 and arrived in New York December 4 1872; departed December 15 for Bremen. did not find any crossings in January. The AMERICA left Bremen February 2, 1873 and arrived New York February 7. Departed New York ?? Arrived Bremen ?? See below. Marine Intelligence: New York Times, 29 March 1873, Wednesday: Arrived: Steam-ship America (Ger.) Bussins, Bremen, March 13 Southampton 16th with mdse and 304 passengers to Oelrichs and Co. New York Times, Wednesday March 29, 1873. Ships Manifest: R Bussins S. S. America, steamer, Bremen to New York March 28, 1873 3,000 tons, steerage, 304 cabin 10, mostly German passengers. Marine Intelligence, New York Times April 3, 1873 Cleared Steam-ship America (Ger) Bussins Bremen via Southhampton — Oelrichs & Co.
Marine Intelligence, New York Times: April 18, 1873, European Maritime News: Bremen April 17, 1873 The North German Lloyd's Steamship America Capt. Bussins, from New York arrived here yesterday. The duration of Berend's service was listed as "7 months and 12 days" from September 30 1872 - ending about May 12, 1873. I only find him listed on the October and March crossings during this period. I tried looking at other seamen on the October 1872 and March 1873 crew lists to see if they appear on other lists during this time period, but I did not have any luck with those I choose. Marine Intelligence reports in the New York Times and the passenger manifests indicate that the S. S. AMERICA made the following voyages between October 1872 and May 1873 and it can be presumed that Berend was on board for all of these voyages although he was only listed on two. The passenger lists posted by Ancestry does not include the crew. October 1, 1872 to November 9, 1972: Berend was listed on the crew list for this voyage. New York Times Marine Intelligence: "Steam-ship America sailed for Bremen December 15, 1872"
Arrived Steam-ship America (Ger) Bussins, Bremen, February 7, 1873 via Southampton 14th Falmouth 18th, and St. John N. F. Feb 2, with 196 passengers to Oelrichs & Co.
Berend Petermann finished his time at sea on May 12 1873. Steam-ship America (Ger.) Buskins (sic) [Bussins per ship manifest] Bremen April 30. and Southampton May 3, with mdse, and 737 passengers to Oelrich & Co. Experienced heavy westerly winds with high seas the entire passage;May 4 lat 49 43 lon 13 45 passed steam-ship Deutschland, hence for Bremen hence for Bremen: 9th lat 46 53 lon 35 30 passed steam-ship Mosel do. dol; 13th lat 42 20 lon 52 28 passed an Inman steamer bound E;same day lat 42 lon 58 passed ship James C Stevenson (of Shiens) bound E 15the lat 40 34 lon 69 39 passed steam-ship New-York hence for Bremen." I do not know what Berend did between the return of the AMERICA on April 17 and May 12 when he mustered out. He may have gone with the AMERICA as far as Southampton and then turned back to Germany. Berend was 30 at the time of the March 12 to April 17 trip which appears to have been his last transatlantic trip as a merchant marine. He would return to the States about 10 years later with his wife and small son. While he was giving addresses in Ganderkesee and Hoyerswege from 1859 to 1873 Berend Petermann was obviously spending a lot of time at sea and traveling around the world. 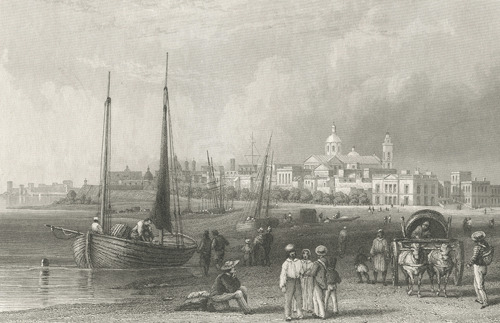 Southampton, Hampshire, England was inked to London by rail in 1840. 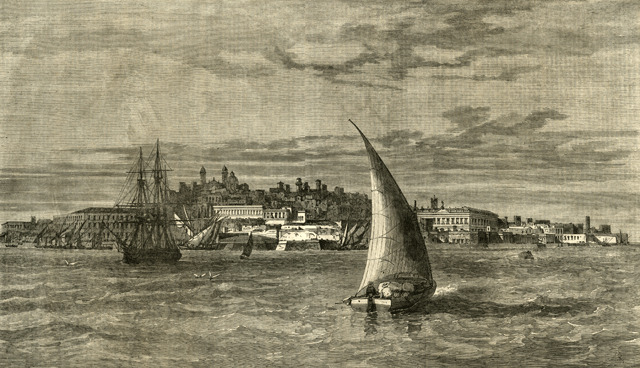 Southampton was an emigrant gateway from Europe to America. Berend Petermann was listed as a helmsman on the GRAF BISMARCK in 1872 and on the AMERICA in 1873. There were 4 helmsmen on the GRAF BISMARCK which had a crew of 92. There were four helmsmen on the AMERICA which had a crew of 104. The first crew members listed were officers. Then there were 6 listings on both ships. I cannot make out all of them but 2 listings on each ship were "zimmerman" [carpenter]. These six listings were followed by the four helmsmen. "HELM - Neither the master nor mates of a merchant vessel ever take the helm. The proper helmsmen are the able and ordinary seamen. Sometimes the carpenter, sailmaker, &c., if they are seamen, are put to the helm; also the boys, in light wind, for practice. Each watch steers the ship in turn, and the watch on deck must supply the helmsman, even when all hands are on called. Each man stands at the helm for two hours, which is called his trick. Thus, there are two tricks in a watch. Sometimes in very cold weather, the tricks are reduce to one hour; and, if the ship steers badly, in a gale of wind, two men are sent to the wheel at once. 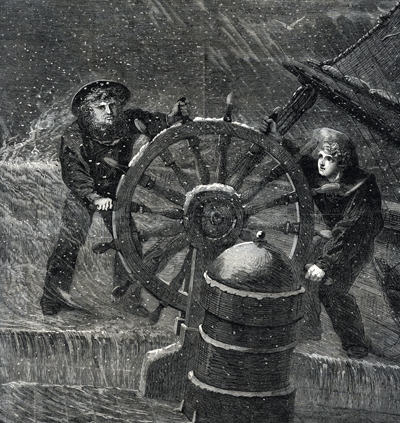 In this case, the man who stands on the weather side of the wheel is the responcible helmsman, the man on the lee wheel assisting him by heaving the wheel when necessary." However, Dana was writing before the advent of the steamship. It is clear from the Bremen crew lists that there were special people designated as "helmsmen". They received a higher pay that sailors and were listed at the beginning of crew list ahead of the "sailors". Ships under sail had the right of way before steamships. It is the responsibility of the steamship helmsman to steer clear of sailing ships. In the old sailing vessels the helmsman could not see ahead of him but steered the ship by compass with direction from the officers of the ship. 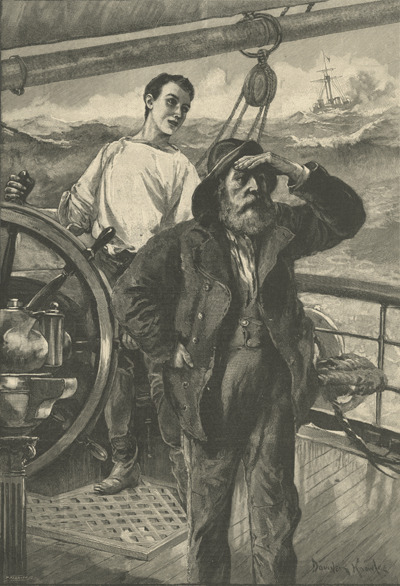 "After the ship's course has been set, the helmsman's duty is simply to watch the compass and move the wheel whenever the ship in her progress turns to the right or left from the course laid down"
With the advent of steamships the wheelhouse was moved forward so the helmsman could see ahead of the ship. "It is a fascinating business steering a big sailing-ship, and keeps all one's faculties and senses at work; one knows how to steer more by instinct than anything else, and unless you are born with this instinct, however much practice you have, it is impossible to become a really first class helmsman." "A good helmsman has to be born, not made. Every boat and every ship steers differently. Some steer very badly, some steer easily. "The most difficult task of all is to steer a large ship running before a gale of wind in a big sea. A bad helmsman in such a case will have his spokes flying round the whole time; first his helm will be hard up and then hard down and the ship will be swinging a couple of points on each side of he course. This is because he probably watches his compass too much and his ship too little. A good helmsman will know instinctively when his ship is beginning to come up, and will at once meet her with the helm a second or two before the compass shows the fact." "On January 1, 1871, the German merchant fleet included 4,372 sailing vessels with a tonnage of 900,301 and manned by 34,739 men." The North German Lloyd Company was founded in Bremen in 1857. A rival company, the Hamburg-American, was established in Hamburg in 1847. In 1871 the German fleet of these two. companies had only 147 steamships By 1898 they had over 1,000 steamships. They were the two largest and wealthiest shipping companies in the world outfitted with a hugh fleet of iron and steel ships, among the fastest and most powerful ships on the seas. I will not begin to pretend that I know anything about navigation. It is way too complicated! Basically there were certain routes from one place to another which depended on time of year, tides, winds, etc.. The route from Bremen, Germany to North America was through the English Channel via Southampton (or Liverpool) or direct to New York. The ships headed to Newfoundland and then made their way down the American coast. The North German Lloyd out of Bremen had its New York piers in Hoboken, New Jersey. Before the canals were built at Suez and Panama ships going from Germany to the Orient used the prevailing trades winds and headed south along the coast of Spain, past the Cape Verde Islands and across the Atlantic to near the coast of Brazil. From there they made their way down the coast of South America. "In sailing-ship days, all vessels followed about the same track in going south from Europe or America, until they had to choose between going west around Cape Horn, or east past the Cape of Good Hope." Rounding either Cape was tricky. 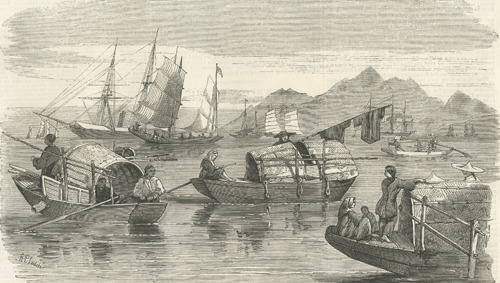 Yet ships continued to use the routes around the capes even after the canals were opened. A major factor was the cost of fuel to run the steamship through the canal versus using free wind power to round the capes. Fuel also took up room that could be used for valuable cargo. The last Bremen seaman's record for Berand Petermann was in 1873. Sometime between May 1873 and 1879 Berend moved to Elsfleth, a port at the confluence of the Hunte and Weser Rivers. J. Berand Petermann had a son born in Elsfleth in 1879. At the birth of his son, Johann Berend Peterman was listed as a helmsman. The Weser is one of the major rivers in Germany. It flows north through the major port cities of Bremerhaven and Bremen. However, the river is rather shallow and during periods of drought was not navigable near Bremen. Elsfleth lies about midway between the two cities.